Dia picked a Grassroot dress to wear to a birthday party on Saturday evening, wearing the ikat creation with silver earrings and ankle-strap sandals. She looked lovely! While on the sets of her show, Neha was photographed in a printed dress by Grassroot, one that she paired with a Bodice vest. With her hair in a wispy knot, she rounded out her look with hoop earrings, a stacked wrist that included a Tiffany & Co cuff and pair of Aldo sandals. The radiant mother-to-be made the separates work for her. 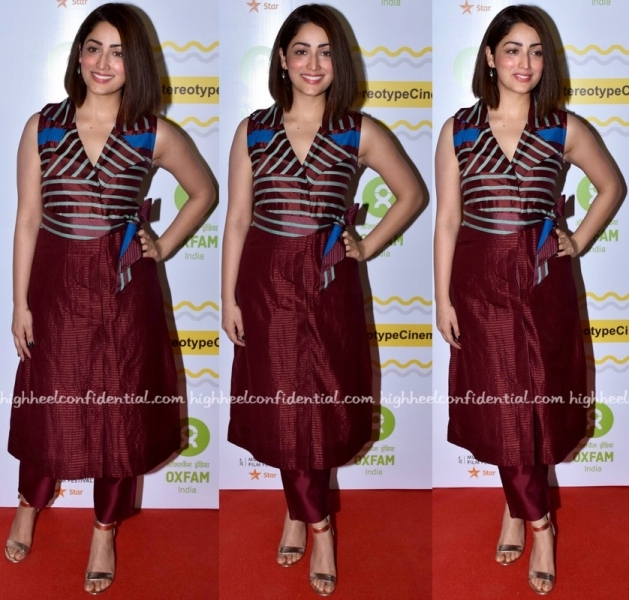 Latest round of movie promotions had Aushka wearing an Anita Dongre Grassroot dress. A pair of black ankle-strap sandals rounded out the actor’s look well. She looked nice; the colors looked great on her!